The Gravettian toolmaking culture is named after the type site of La Gravette in the Dordogne region of France where its characteristic tools were first found and studied. It dates from between 28 000 and 22 000 years ago. 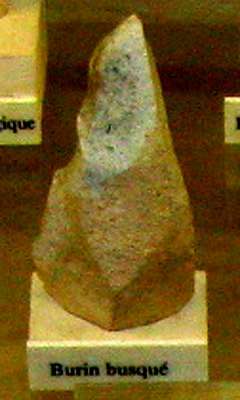 Artistic achievements of the Gravettian cultural stage include the hundreds of Venus figurines, which are widely distributed in Europe. 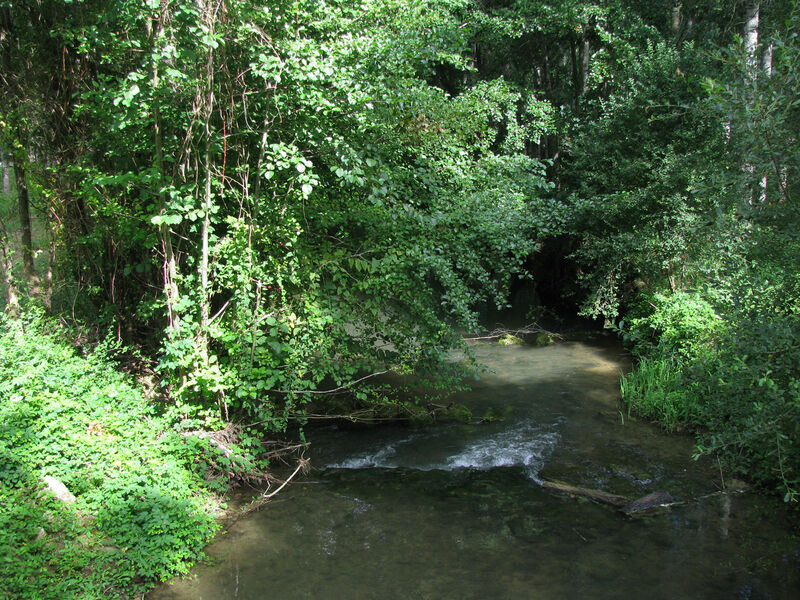 The site of La Gravette is in the valley of the Couze River, a pretty little stream. 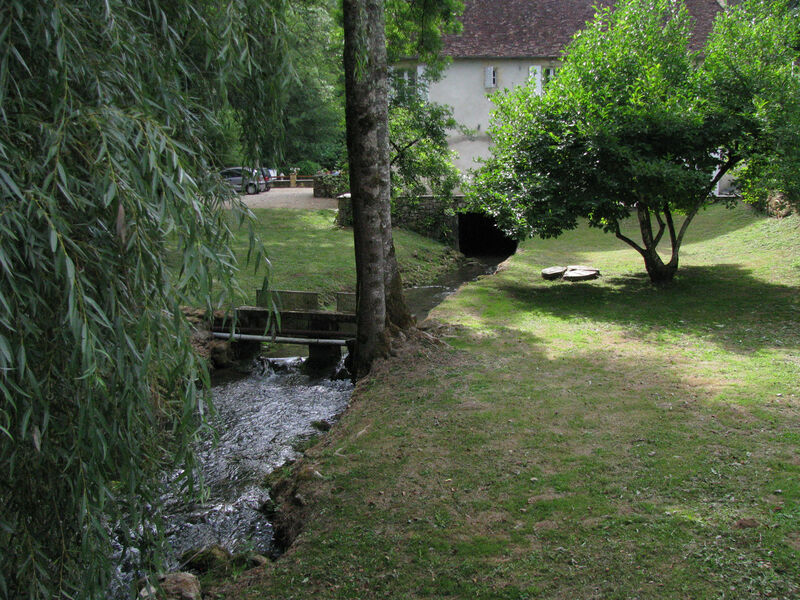 The Couze passes through the little village of La Gravette. This house straddles the stream. It is not often that you find a river running underneath a house! 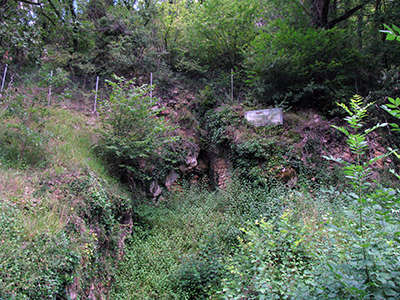 The gisement, or archeological site of La Gravette is not easy to find, and has no identification as to its significance as the type site for the Gravettian culture. The site is quite overgrown. It has not been touched for fifty years because of a condition of its donation to the state. It is an historical monument, protected by French law. The site of la Gravette. The site of la Gravette, 8 March 2015. Permission: Creative Commons Attribution-Share Alike 4.0 International license. Map of sites in the south of France, including La Gravette, showing ice age coastlines. This is the plan of the gisement by Lacorre. It would be good to get a higher quality image of this important document. Cover, and a drawing of the original gisement of La Gravette. From La Gravette, le Gravettien et le Bayacien, by Fernand Lacorre. Bâtons percés, pierced batons, spear straighteners. (centre): Pierced shell, possibly a turret shell, as a pendant. 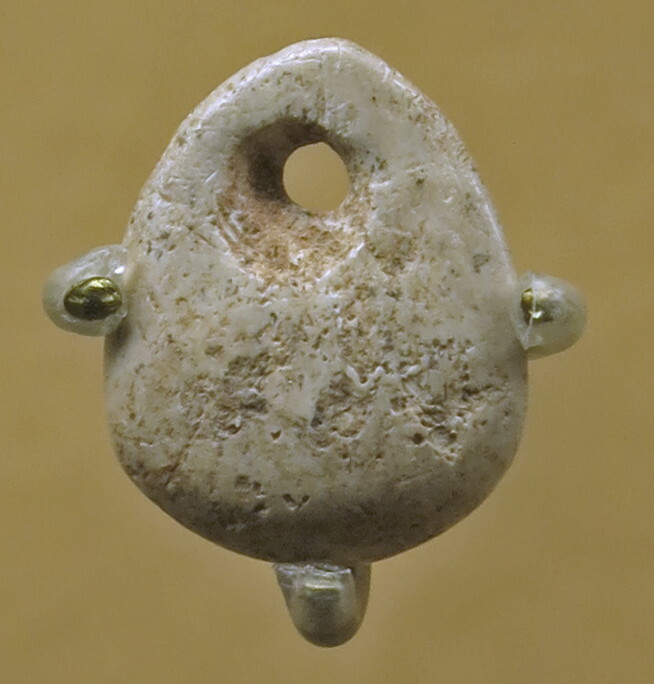 (right): Pierced limpet shell used as a pendant. Note that the 'Bayacien' underlies the Gravettian but is closely associated with it. From left: Burin de Noailles, fléchettes. centre right and right: Grattoir, scraper. centre left, centre right, right: Burin busqué, beaked burin. A very fine quality scraper from la Gravette. 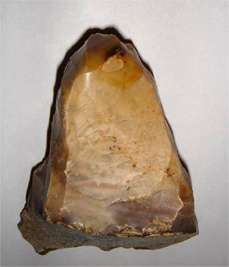 Flint fléchette from La Gravette. Dimensions: length 60 mm, width 11 mm, depth 3 mm. Dimensions: length 59 mm, width 4 mm, depth 1 mm. 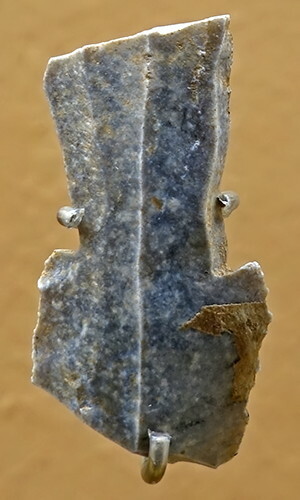 Gravettian shouldered points, pointes à cran. (left): Shouldered point from La Gravette. (left): Dimensions: length 59 mm, width 12 mm, thickness 5 mm, Catalog MAN81994. (centre): Dimensions: length 64 mm, width 12 mm, thickness 5 mm, Catalog MAN81812. (right): Dimensions: length 107 mm, width 20 mm, thickness 8 mm, Catalog MAN81781. 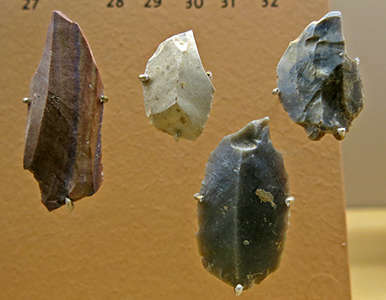 A selection of tools from la Gravette, including scrapers and burins. 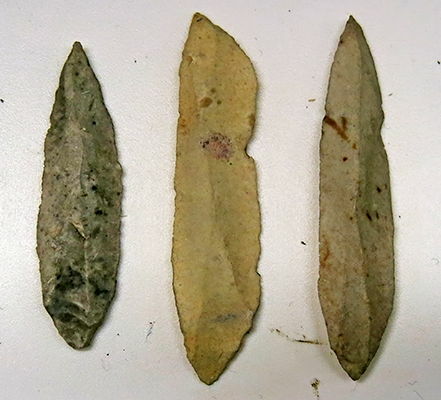 Burins, scrapers, and Gravette points. 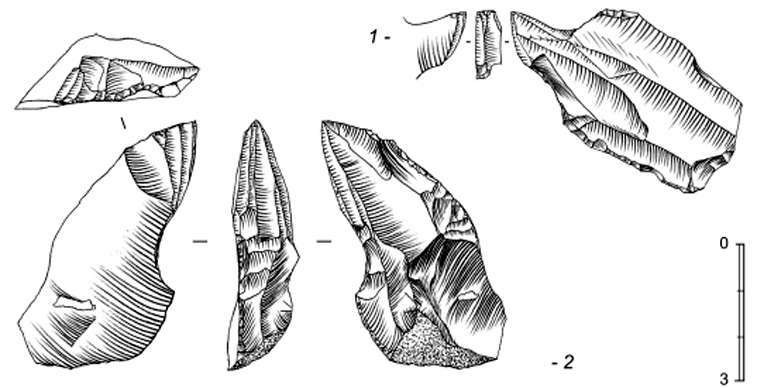 Gravettian points, from Laussel and la Gravette. 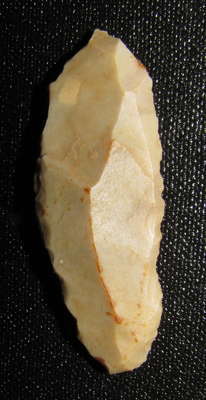 This is a fléchette from Les Eyzies, found during the early 20th century. 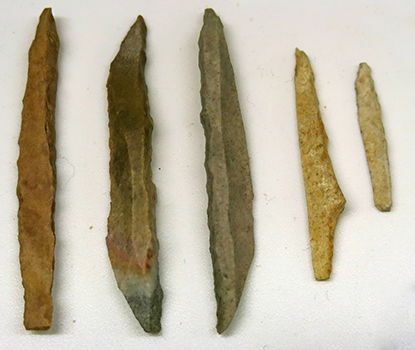 Flechettes are leaf-shaped points characterized by short, semi-abrupt retouch, sometimes inverse, at one or both extremities of the blade blank, extending sometimes along one or both margins. 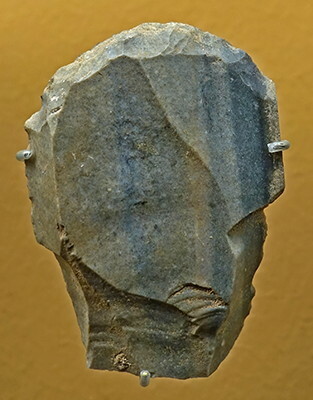 This tool was found frequently associated with other fossil-directeurs of the Gravettian, including Font Robert points and Noailles burins. 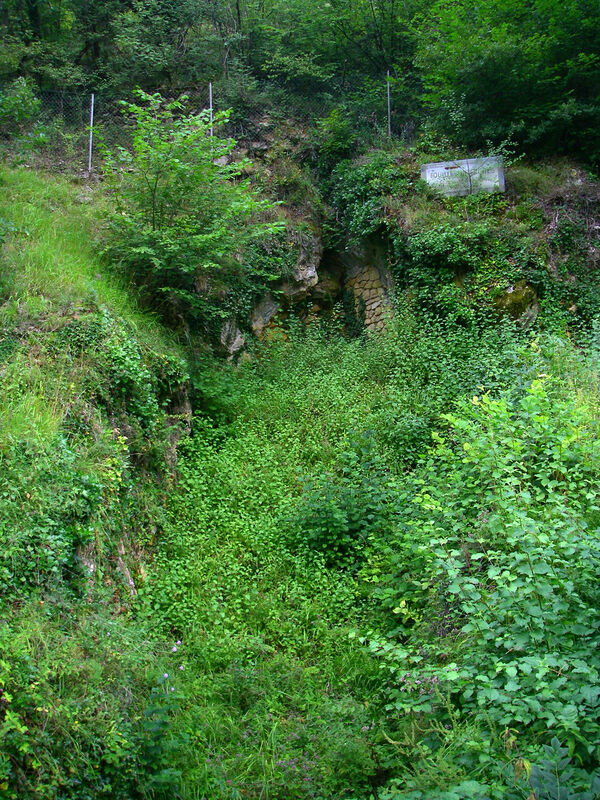 However, these associations are often from sites with a poorly defined stratigraphic context because the majority of excavations of the Gravettian deposits took place between 1890 and 1940 (Pair non Pair, Oreille d’Enfer; Grotte de la Crouzade, Abri Vignaud, La grotte de 'chez Serre' at Noailles, Mas Nègre, Puyjarrige). 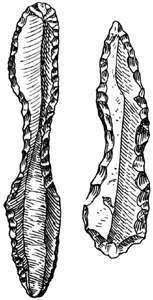 (left): Gravettian spear point in reindeer antler from la grotte d'Isturitz. Dimensions: length 106 mm, width 10 mm. 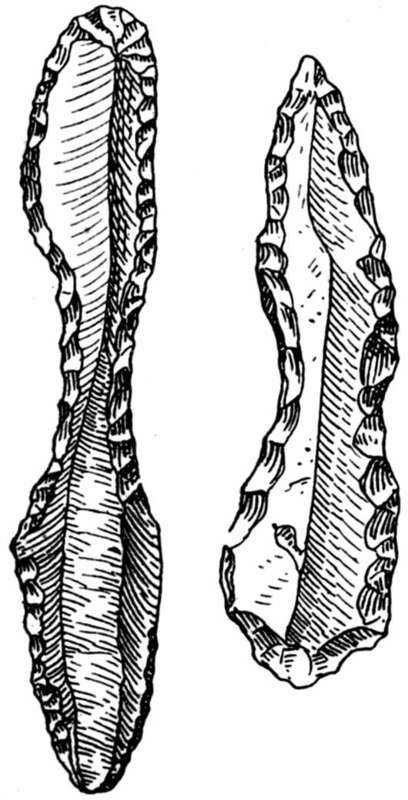 (right): Gravettian spear point in reindeer antler from la grotte d'Isturitz. Dimensions: length 86 mm, width 11 mm, thickness 5 mm. Gravettian age microgravettes from la Gravette. 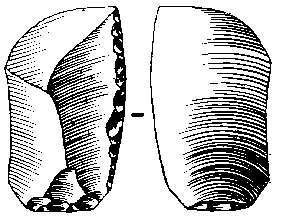 These microliths are slightly larger than the geometric microliths that followed, and were made from the flakes of flint obtained ad hoc from a small nucleus or from a depleted nucleus of flint. 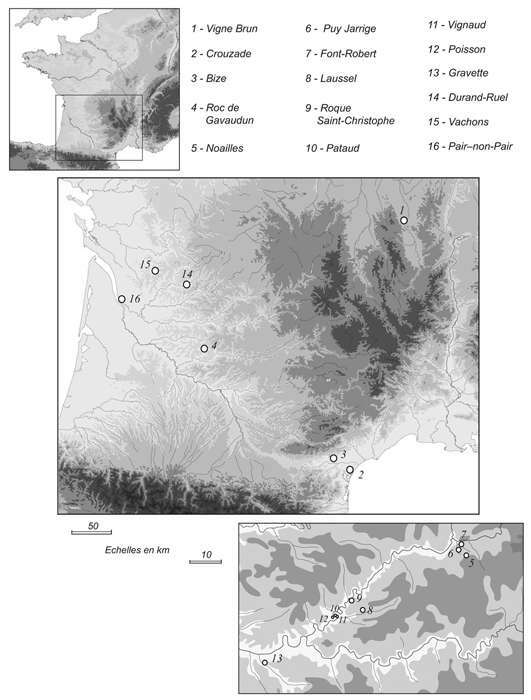 Geographic distribution of fléchette sites. 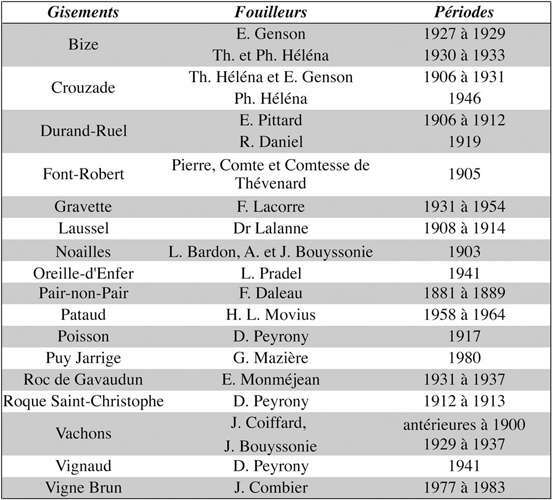 Researchers and dates of excavation of fléchette sites. 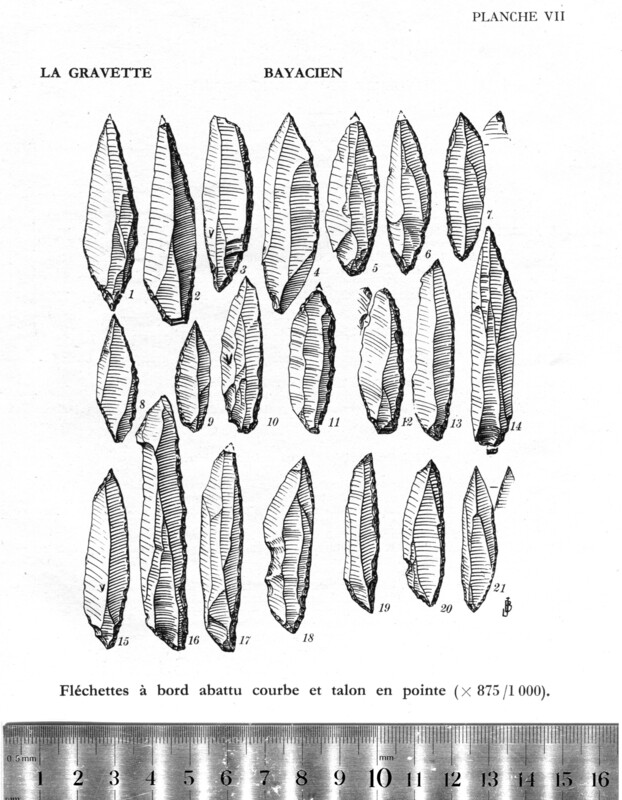 Fléchettes, bayacian level of La Gravette. Fléchette cores, bayacian level of La Gravette. Tools and core resulting from the fléchette chain of operations, bayacian level of La Gravette. 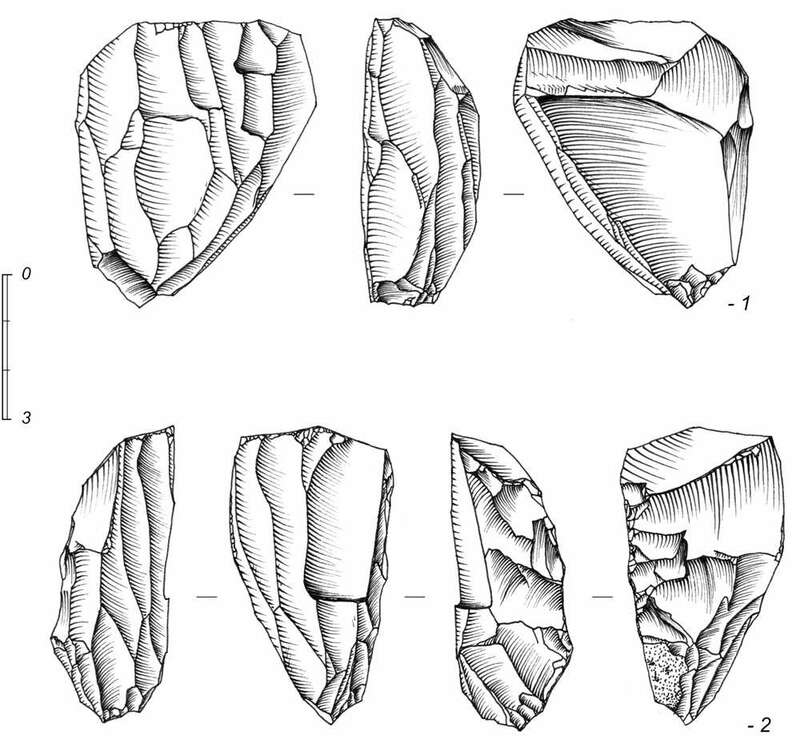 For comparison, these are fléchettes from another Gravettian site, La Vigne Brun, located in the upper reaches of the Loire river valley, hundreds of kilometres from La Gravette. See the map above. These techniques allow data to be considered in an original way from the early stages of Gravettian . 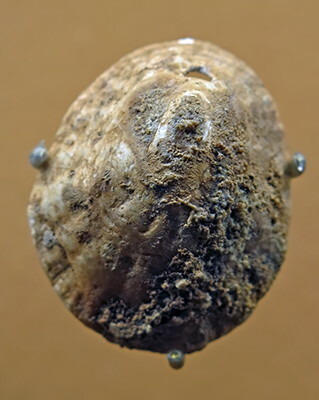 They reveal that the Bayacien is indeed a separate entity and rightfully unique within the Gravettian sphere. 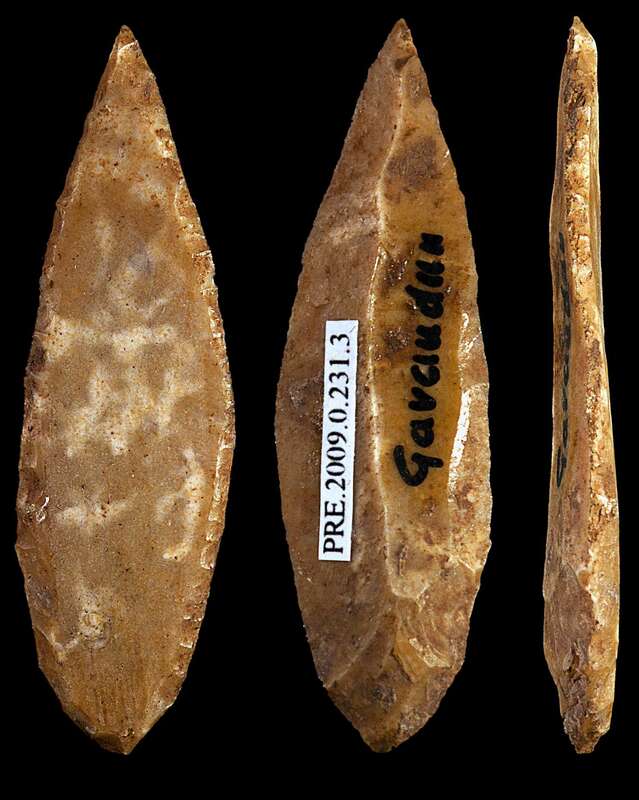 Recognizing the originality of the Bayacien raises many implications for the associated paleohistoric and changes our understanding of the passage of the Aurignacian to the Gravettian. The major restructuring of technical systems between the Aurignacian and the Gravettian can be seen as a reflection of the profound changes affecting these tools of the Upper Paleolithic. This site was discovered by Mgr. Chastaing in the spring of 1880. Shortly thereafter, Tababou and Costes excavated there and sold the collections to the Musée de Bordeaux, the Musée de Périgueux, and to some Americans. Some pieces were even sold by Chastaing to the Musée de Latran in Rome. Afterward, the excavations were renewed by Landesque, and then by Féaux, Hardy, Delugin, Testut. 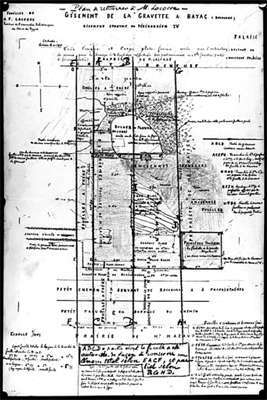 On July 14, 1930, Lacorre and M. Neuville opened a trench (Lacorre 1931, 1933, 1960) and later excavations were carried out between 1950 and 1954. The site was donated to the Musée des Antiquités Nationales in 1958. 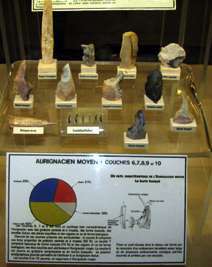 It contains a sequence of Aurignacian and Gravettian as well as a level with darts that has been called the Bayacian (Lacorre 1960; Delporte 1972). (Note: I present below this abridged and translated version of the very important paper by Delporte (1972) in an effort to make its important conclusions better known. 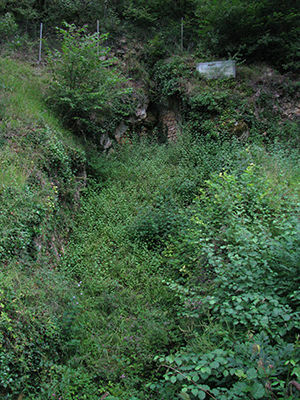 The site of la Gravette has very scant information about it available on the internet, which is a lamentable state of affairs for the type site of the Gravettian. 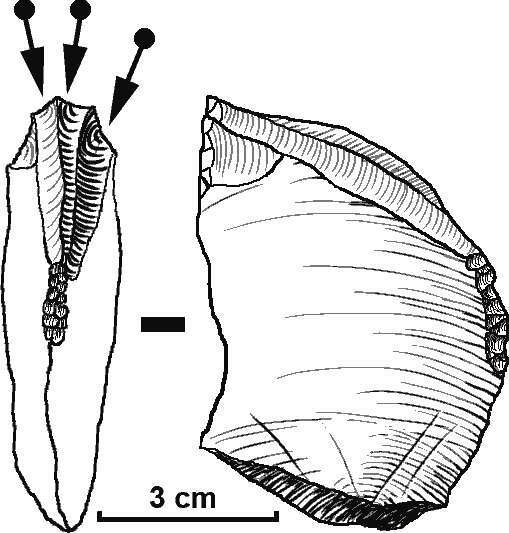 The Aurignacian and "Bayacien" of La Gravette: Implementation and statistical problems. The eponymous deposit of la Gravette is located in the valley of the Couze in the commune Bayac (Dordogne). 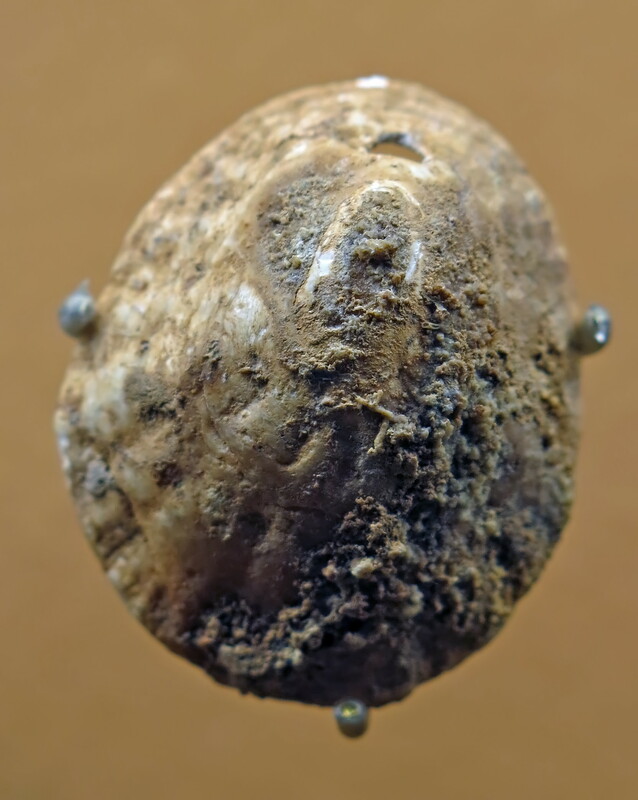 Discovered in 1880 by Chastaing it was studied by many researchers who dispersed much of the Paleolithic material found amongst different French and foreign museums and collections. 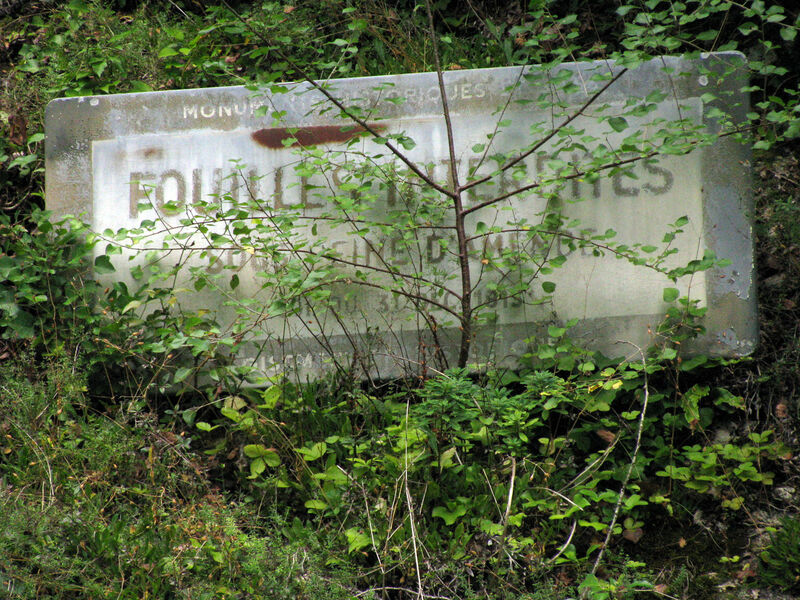 The site was then purchased by F. Lacorre who continued excavations between 1930 and 1954, although Lacorre's enterprise has some unusual aspects which it is not our place to judge (we speak of the theft of part of the collection, and sales more or less clandestine, etc) we must recognise that it has, at the end, resulted in a positive outcome, reflected in the publication of a major monograph (Lacorre, 1960), whose scientific value has been discussed, but that is no less precious, if only because it is exceptionally illustrated by almost 80 photographic plates due to its excellent designer, Canon J. Bouyssonie, and has also prompted the donation, made in 1958 at the Museum of National Antiquities, of the major part of the items collected during the excavations, and the gisement itself, provided, however, there will be no excavations for a period of 50 years. 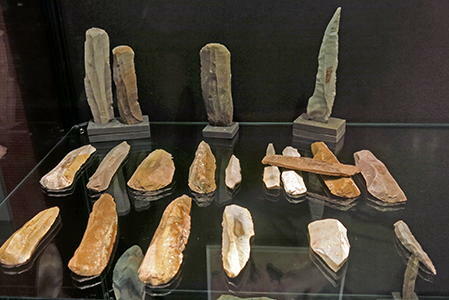 The archeological site (gisement) of la Gravette is of considerable importance for the understanding of the French Upper Paleolithic. In fact, we should remember, it is the eponymous Gravettian site, that is to say, in the strict sense of the Périgordien IV of D. Peyrony. It is an industry that is currently known only from relatively unimportant archaeological deposits. 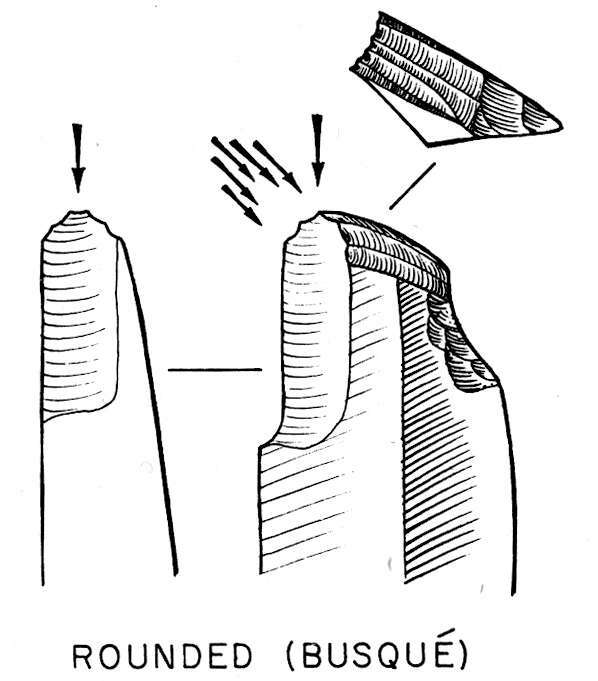 The publication of Lacorre (Lacorre, 1960) provides some indications of this understanding, especially as regards the presence of a notch tip on some tools in the most recent Gravettian layer. 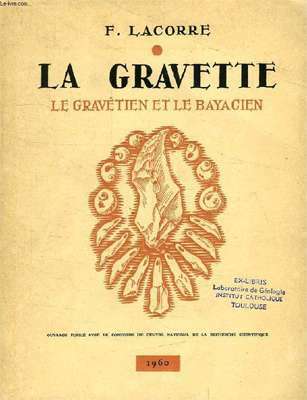 It seems however not possible at present to resume the study of this material; in effect, the study of the Gravettian will be substantially renewed only by the comprehensive publication of recent excavations by H.-L. Movius at the abri Pataud (les Eyzies, Dordogne), and only then will the la Gravette series be able to be reconsidered. 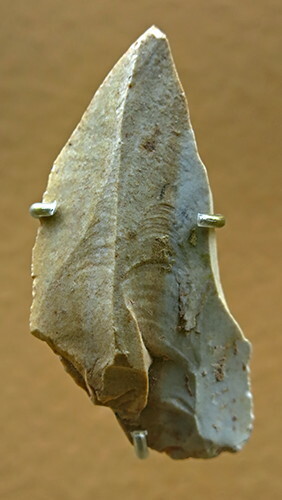 But the gisement of la Gravette is also the eponymous site of another industry, quite original, which Lacorre called le Bayacien, characterised by the presence of many leaf shaped points exhibiting a marginal retouch called flechettes Lacorre which have not been found, in a form similar to that of la Gravette, in any other gisement. 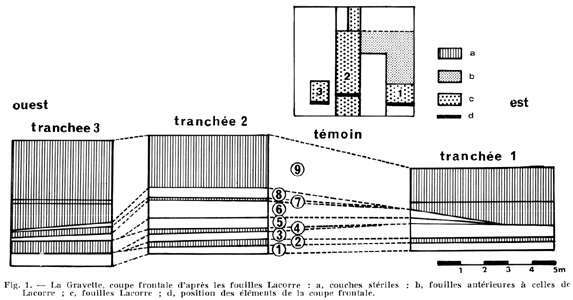 At the site of La Gravette, according to F. Lacorre (Lacorre 1960) we distinguish two different levels: the bottom (layer C) is characterized by fléchettes ("Bayacien") and devoid of gravettes, the upper (layers D and F) by gravettes of a large, medium and small size ( "Gravettien"). The flechette is a leaf-shaped point, with two symmetrical sides, obtained by steep marginal retouch. The Gravette is a point with a straight or slightly curved back. 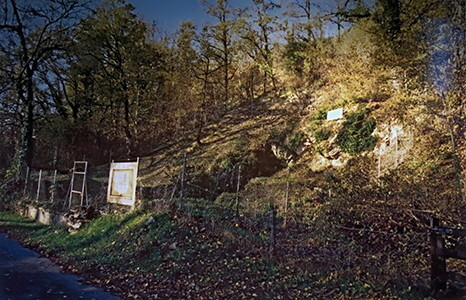 The understandable desire for an immediate resumption of excavations at la Gravette has been thwarted because of the conditions on the site imposed by the donor. Thus, the study of the Bayacien, or the so-called Bayacien, can not be undertaken except for the study of the more or less truncated Lacorre collections in museums. It is therefore a unique situation, but it has resulted, of necessity, in much of the work undertaken in recent years in the Musée des Antiquités Nationales. 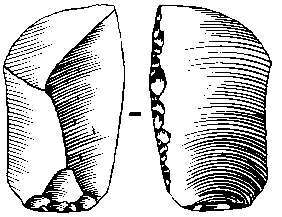 Stratigraphy of La Gravette, from the excavations by Lacorre. b: Excavations previous to those of Lacorre. d: Strikes of the cross sections used for the diagram. 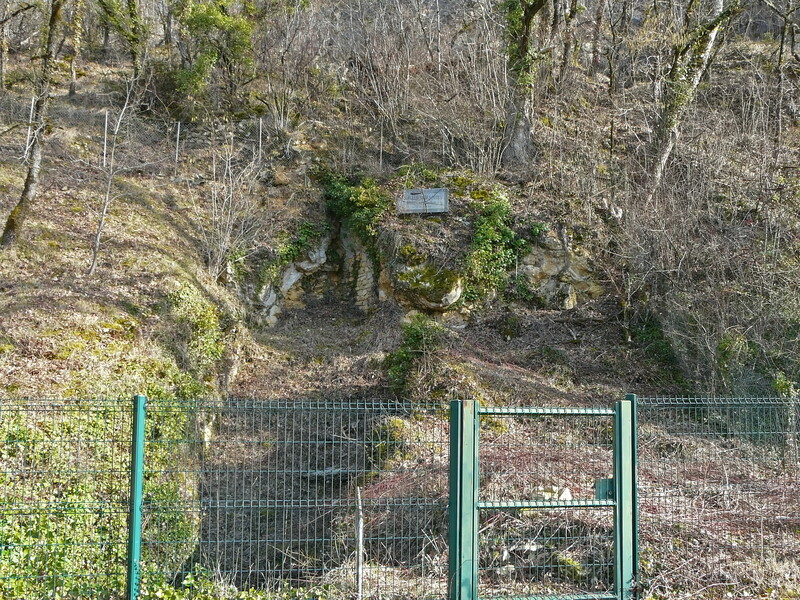 As with most stations, the stratigraphy of la Gravette is not uniform from one end to the other of the deposit. 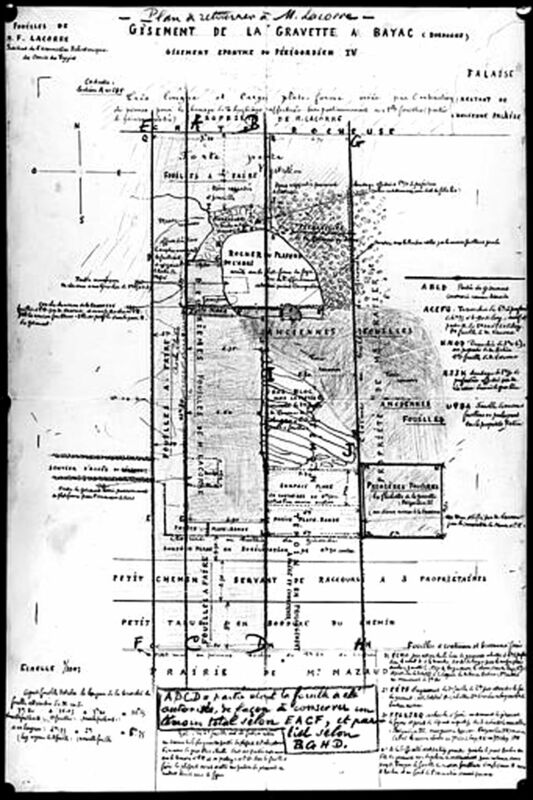 Lacorre successively dug three trenches, numbered from east to west, and for each of which he has surveyed and published a cross section; in addition, his monograph provides us with a sagittal section (a division of left from right) for the second trench. 1. 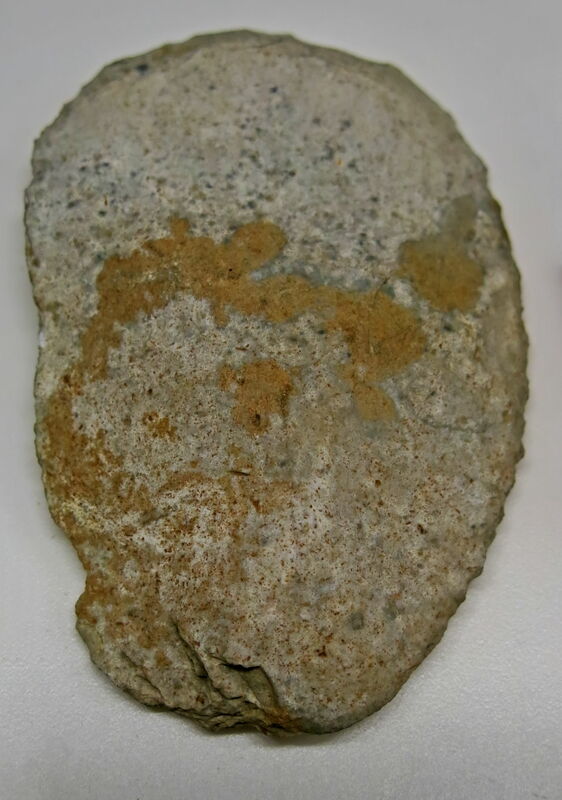 At the base, a layer of dry rubble in which are dispersed flints allocated to the Aurignacien évolué, with a thickness of about 30 cm. This layer is separated from the the second layer by the sterile Layer 2. 2. A sterile layer whose thickness varies between 20 and 50 cm. 3. 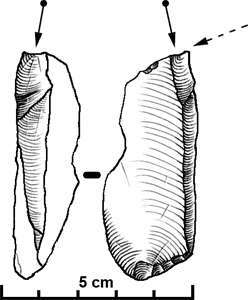 The second archeological layer exists only in trenches 1 and 2. The second trench, however, turned up some rare pieces that have not been found in the first trench. 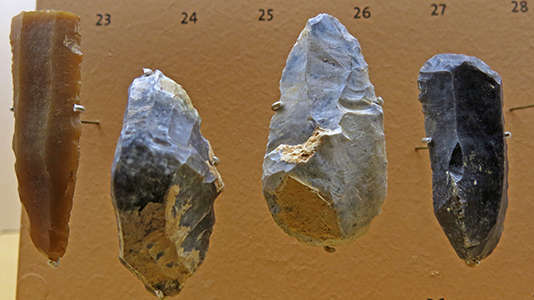 In the second trench, the archeological layer has an average thickness of 65 cm, and has furnished an abundant set of tools to which Lacorre has given the name Bayacien. It is directly, but partially, overlain by the Gravettian formations. 4. A sterile layer non-existent in the first trench and merged with Layer 2 in the third trench. 5. A yellow layer (average thickness, 40 cm), relatively poor and only existing in the first two trenches. 6. 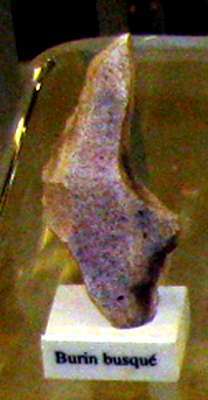 A red layer, with a maximum thickness of 70 cm, rich in artefacts, which was encountered in three trenches, and is directly superimposed on the previous layers where they exist. Moreover, we do not know the reasons for the colour variation between the two layers. 7. In the second and third trenches, there is a sterile layer of 10 cm thickness, which, according to Lacorre, systematically separates the two upper Gravettian formations 6 and 8. 8. A black layer, average thickness of 40 cm, also very rich in artefacts, present in the second and third trenches. 9. Sterile and superficial formations of variable thickness. It is also worth noting that Lacorre was preoccupied about what he calls the environment of the Paleolithic populations of Gravette and has therefore published paleontological and sedimentological indications of variable value, but which are none the less interesting. He noted in particular that the Aurignacian and, to some extent, the Gravettian correspond to periods of a fairly moderate cold climate, while that of the Bayacien is much more rigorous. 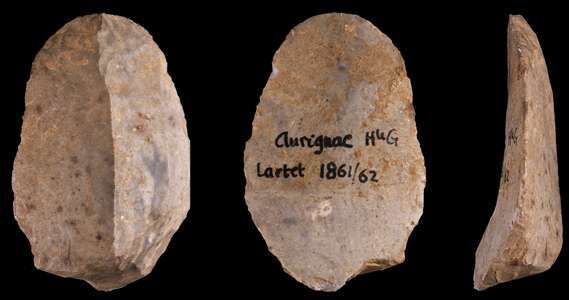 Insofar as these proposals can suggest a hypothesis, and by reference to recent work on the climate of the Aurignacian-Perigordian period (Leroi-Gourhan, 1968), we are able to place the Aurignacian of la Gravette at the end of the interstadial D'Arcy, the Bayacien in the stadial Arcy-Paudorf and Gravettian in the interstadial Paudorf. This last position would fit well with that of the Gravettian shelter of l'abri Pataud, of which it is well to remember that the Carbon 14 dating ranges between 28 000 and 26 000 B.P. In any case, even if in the future - which could be quite distant - we must make clarifications and corrections to what we know about la Gravette, it is nevertheless the case that this station has delivered rich and original industries which should be submitted to an accurate typological study, at least with regard to the Aurignacian and the "Bayacienne" series. It should be noted that the Aurignacian, where it occurs at the same site as the Gravettian, precedes it. 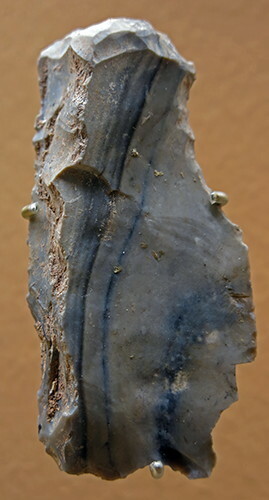 This is an Aurignacian scraper on a blade, from the type site, Aurignac Cave in Southern France. 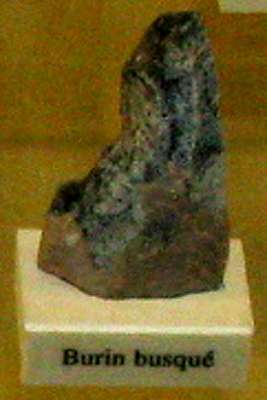 The Aurignacian deposits, in which 107 artefacts were recovered, is characterised by more homogenous material than the Gravettian series. Against this result, it must be reported that there was a great variety of patina and the fact that a good number of the pieces had traces of lustre. 1. 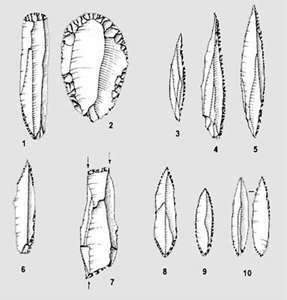 Scrapers (grattoirs) are very numerous (67.29%) and, overall, well made and very regular. 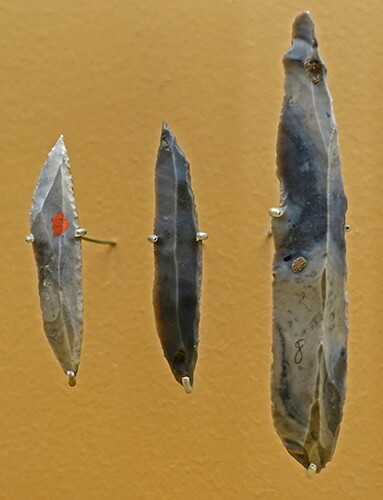 The scrapers were made on the end of a blade, sometimes on both ends, and were not usually on a retouched blade, and never on a true Aurignacian blade. 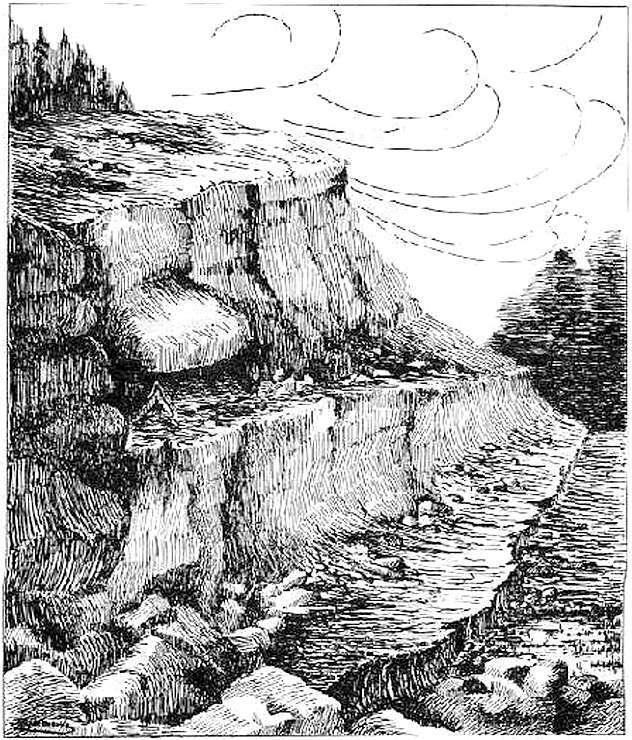 There was a good series of scrapers on large and relatively flat flakes, but which were different, by their dimensions as well as by their retouch, to those of the Gravettian. 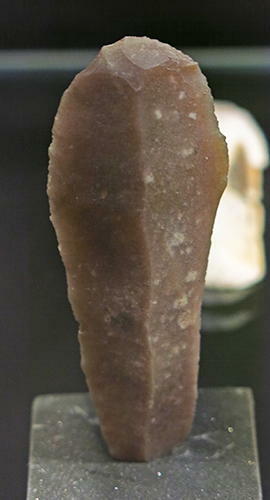 The tools, generally large, are characteristic, although the lamellar retouch of the used portion does not reach the fineness and smoothness of many examples of the Aurignacian II. 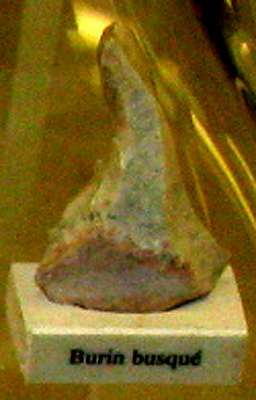 As for Grattoirs à museau, known in English as muzzle shaped scrapers, or "nose" scrapers, they are virtually absent. 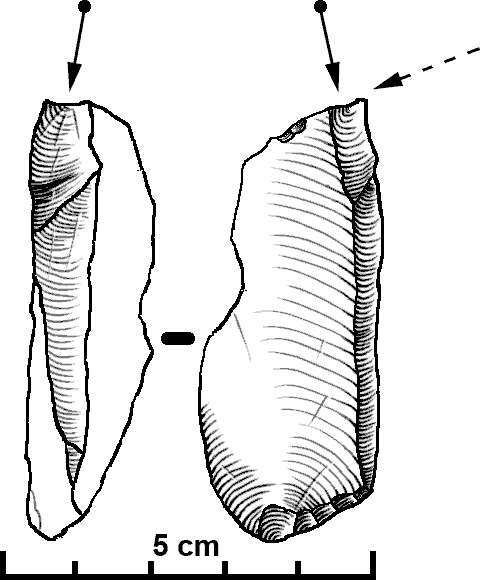 Right: Carinated burin, a small multiple burin characteristic of the Gravettian, ca. 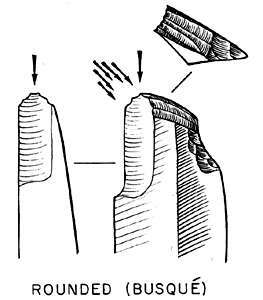 28-23 000 BP; these flake tools have been restruck and refined to give several chisellike edges and a blunt, grippable rear edge. 2. 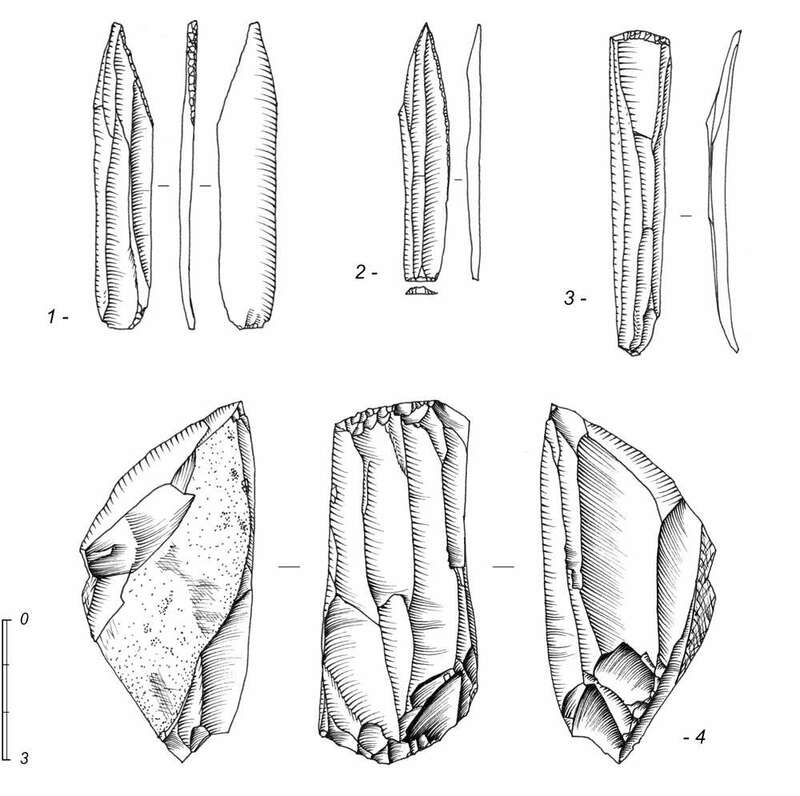 Burins are relatively abundant for the Aurignacian (20.56%) and they almost all belong to the family of dihedral burins or chisels, the series has only one burin with oblique truncation. The most interesting group is made up of small tools ( Lacorre, 1960), which represent a transitional form between the dihedral angle burin and the beaked burin. 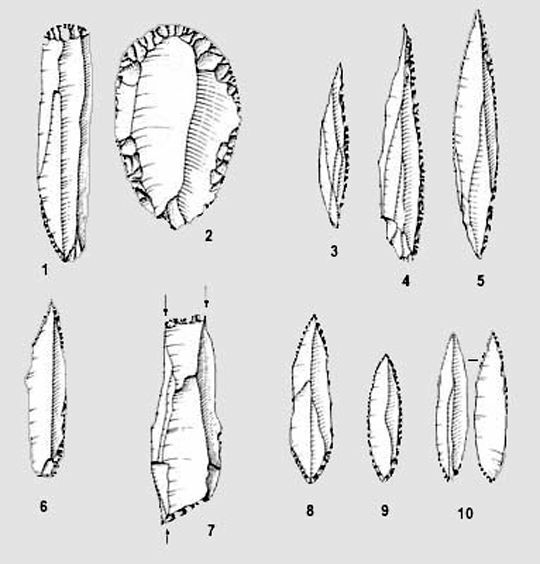 It is interesting to observe that the great majority of burins in this ensemble - exactly 2/3 - is represented by dihedral burins and by atypical beaked burins, and also that there is a real morphological relationship between the two types of burins. 3. 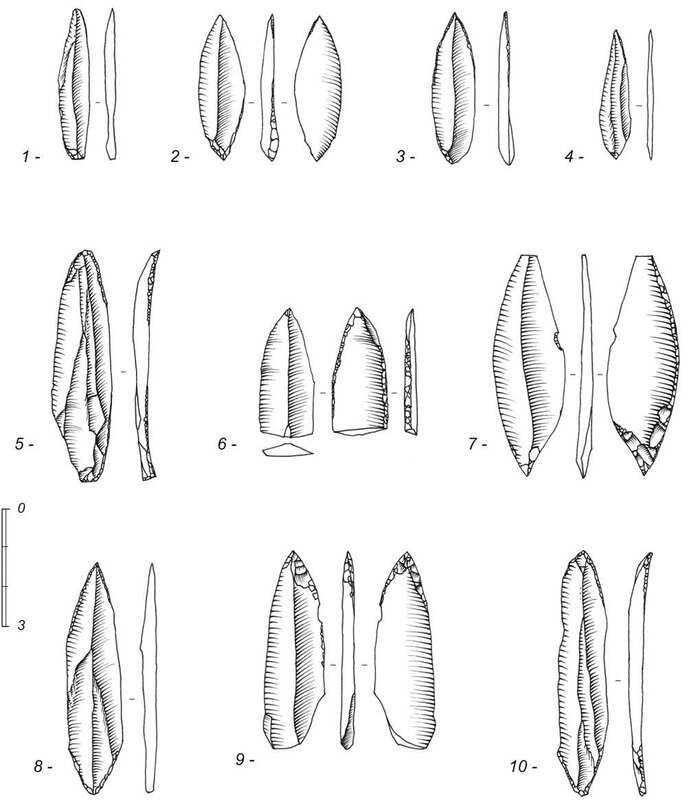 Apart from scrapers and chisels, which together represent nearly 90% of the tools, the rest comprise nothing very distinctive, except perhaps for one "choked" blade, reminiscent of the Aurignacian I, for which the retouch is irregularly denticulate. Photo and text: Wikipedia - public domain image. 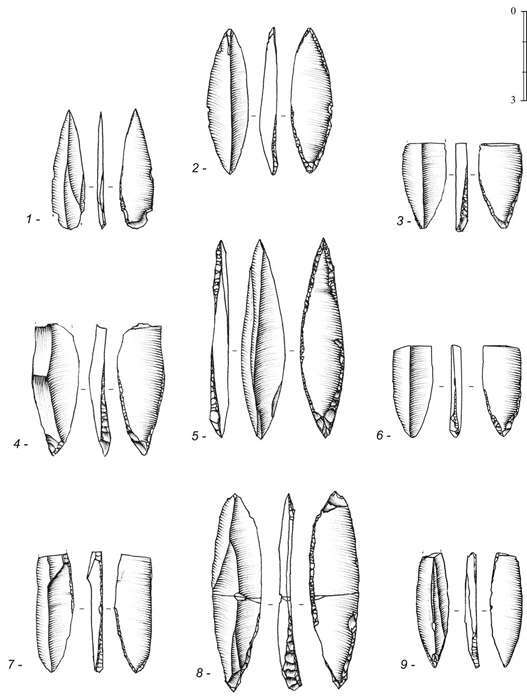 Aurignacian blades personal scan from 'Manuel d'archéologie préhistorique, celtique et gallo-romaine', fr:Joseph Déchelette (1862-1914). Because any control digging is impossible in the immediate future, it must suffice to recall the problem of the authenticity of this industry. There are indeed several fléchettes in many other paleolithic stations, but they are directly associated with a Gravettian industry such as at l'abri Vignaud (Dordogne), or a set of finds belonging to the Périgordian V complex, as at Font-Robert (Corrèze). La Gravette is thus the only site where this fléchette industry was found pure, essentially without any of the classic elements of the Gravettian; this is amazing, but it is not a sufficient reason to formally question the comments of the excavator. Certainly the stratigraphy, as so often happens, does not facilitate the task. In trench 2, the Bayacien is well separated from the Gravettian, but only "a few scattered elements" were found there. In contrast, it is much richer in trench 1, but this time it is in direct contact with the Gravettian, at least in one part of the excavated area. It is reasonable to ask on what criteria Lacorre based the establishment of the separation. 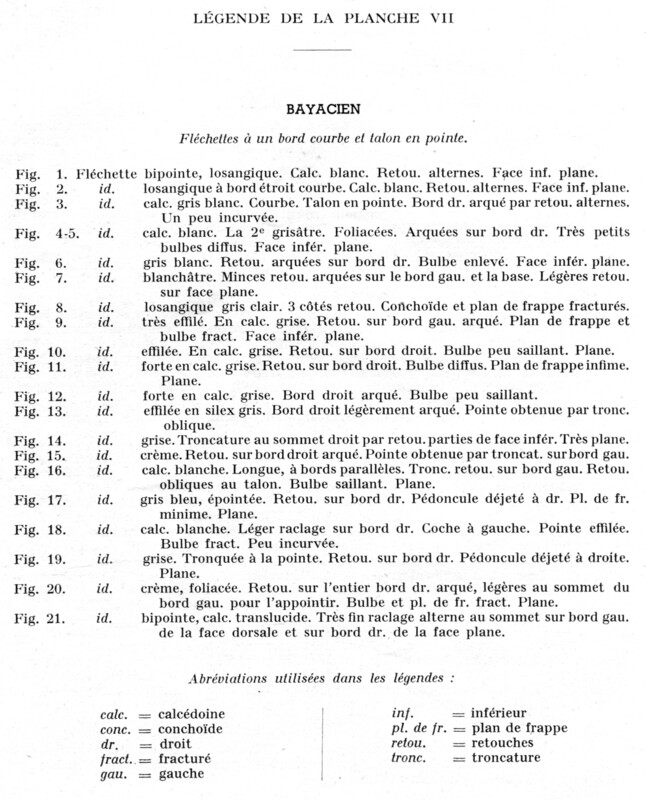 It appears, however, from the book, that the area of habitat was not the same, that of the Bayacien being further from the abri than was the Gravettian; not only that, but the inscriptions carried by some pieces suggests that separate living areas existed in the Bayacienne layer which, we should remember, attained in trench 1, a thickness of about 65 cm. 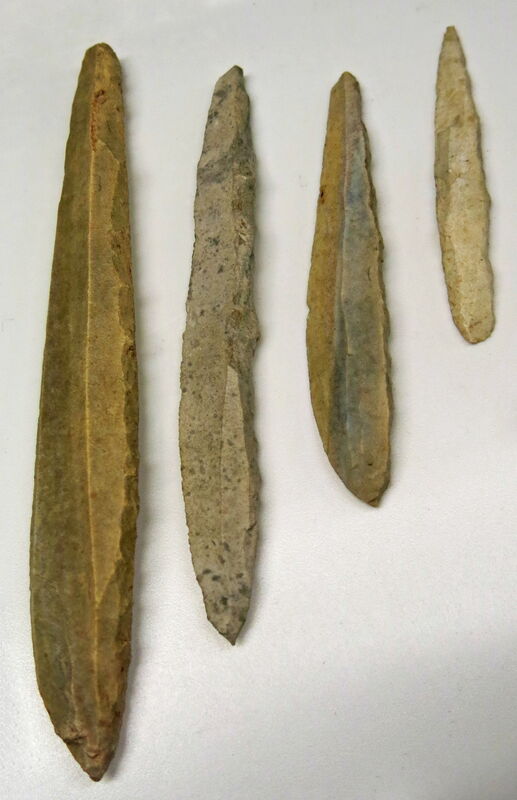 The situation is admittedly complicated by the fact that, apart from the fléchettes, there is a certain community of material, of patina and even debitage (waste material, flakes struck off a core which are not used - Don) between the Bayacien and the Gravettian series. 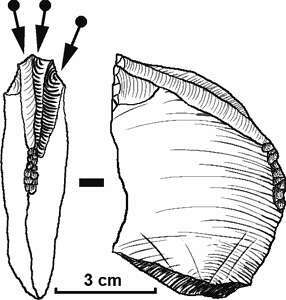 We should also remember that in this ensemble, the Gravettian tools are larger than those of the Bayacian. All told, it appears however legitimate not to reject a priori the possibility of the existence of the archaeological layer and of this industry as the original Gravettian industry. In this industry, the number of fléchettes is exceptionally high: with some unusual pieces and some very rare, we arrive at a total of 119 fléchettes, comprising 56.47% of the tools. Although that is exceptional, this fact should not be regarded as impossible; we should recall that in certain Solutrean deposits, Laugerie-Haute for example, the proportion of laurel leaf points exceeds 40% and can be as high as 53.9% ( Sonneville-Bordes, 1960; Smith, 1966). 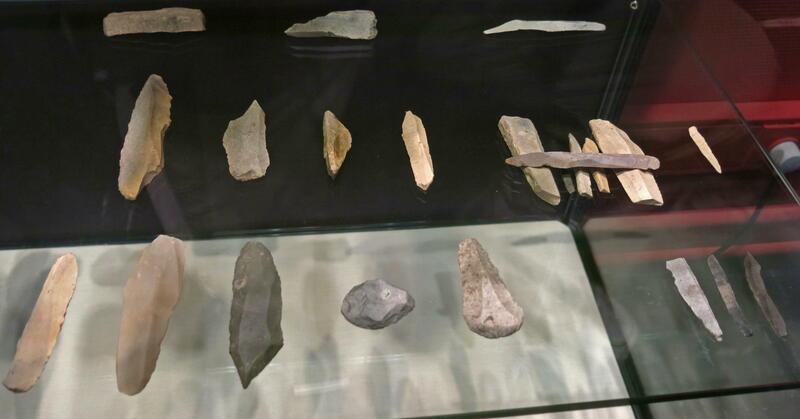 In general, artefacts collected from a site or, more generally, from a fraction of a site, do not constitute a completely accurate sample of a more or less theoretical civilization, but consists of all the tools in one place at one time - perhaps a season - and in particular circumstances. The problem of this specificity of tools has already been discussed with respect to the Perigordian V Noailles burins industries (Sonneville-Bordes, 1953; Delporte, 1962, 1968a). Also, we should not neglect the phenomena of localization already mentioned above about Aurignacian habitats. 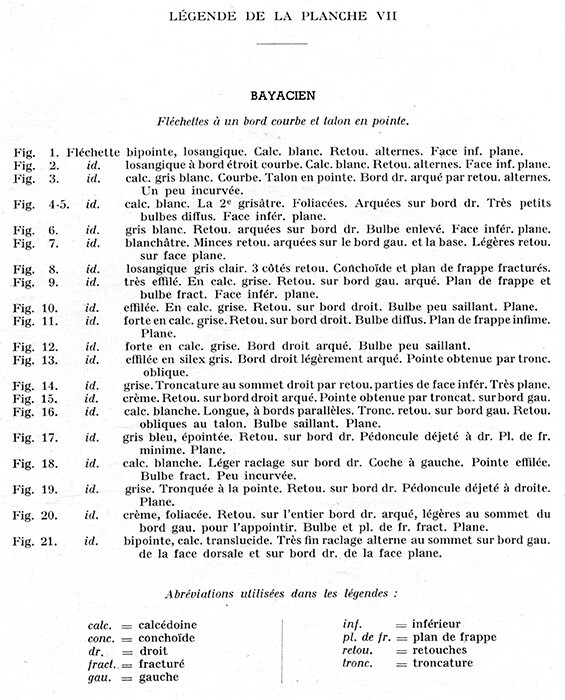 The fléchettes have also been called Bayac points. However we may also add two descriptors about these tools - they are stretched and thin. Stretched, because the average ratio length / width was 3.96. 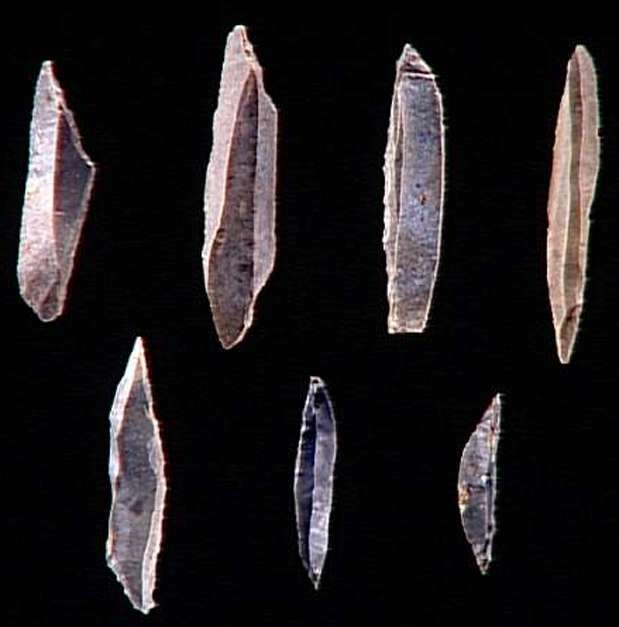 Thin, because the average thickness is about 2 mm, which differs significantly from the fléchettes of the Gravettian points for example. 2. The term "sublozangoid" implies, inter alia, the existence of a point at both ends. This is the case, in general. But it should be added that although the distal tip is always sharp and often very acute, the proximal end sometimes tends to swell and it often forms a rather obtuse angle, sometimes lopsided, and therefore tends to be a true oblique truncation. It is only in 35.77% of cases that we can really speak of fléchettes which are acute at both ends. It seems necessary to add the definition: "the distal end is more often acute. Direct (or obverse) retouch position has been defined as "retouch in which the...removals start from the ventral or bulbar surface. Also called normal retouch" (Tixier 1974). It is called normal retouch as it is the most common retouch found and is the easiest to apply - the knapper works from the ventral surface, which forms a flat striking platform, onto the convex dorsal surface. As illustrated it can only be seen from the dorsal surface and leaves no traces on the ventral face. Inverse retouch position is the opposite of direct retouch position in that it is formed "when removals start from the dorsal surface" (Tixier 1974). It is more difficult to apply than direct retouch in that the knapper must work from a convex surface on to a flat surface. No traces of it can be seen from the dorsal face - it is only visible from the ventral surface. 3. The retouch is characterised by its restraint. However, given the thinness, the retouch could change the shape of the blade very significantly. The retouch is almost always abrupt: on 3 pieces, the reverse retouch tends to flatten and become invasive. It is abrupt or semi-abrupt - abruptly when it is thin, with a thickness which does not exceed a millimetre. When semi-abrupt, it is also very fine, slightly more marked than that of the Dufour blade. 4. Direct retouch is most common, since 67.89% of fléchettes studied bear no traces of inverse retouch. Where it exists, it is - except for some pieces mentioned above - semi-steep, or, more rarely, thin and abrupt, and it is organized in different ways. 1. The lamelle Dufour is, by definition, a blade, much smaller than the fléchette. But it is essentially the morphological characters and technology that separates them. The often curved shape of the lamelle Dufour is opposed to the straightness of the fléchette. 2. The pointe de Font-Yves is of equal size or smaller than the fléchette, from which it differs significantly: the shape, perhaps longer, is also less rhombic; the ends are less consistently pointed, and especially the proximal end is often convex; retouch, almost exclusively fine and semi-abrupt, covers the entire length of the edge, not just on the ends, and it is almost never inverse. 3. The pointe de Laugerie-Basse or "fléchette with inverse retouch" (Sonneville-Bordes, 1960) is close to the typical fléchette. It diverges, however, by the fact that the proximal part is rarely angular or truncated, and especially by the disposition of the retouch. 4. The pointe de Tursac can not be defined accurately, but it differs from the fléchette in its greater size and by special arrangement of its retouch, but the general shape of some of them approaches that of the fléchette. 5. The pointe de Châtelperron: some fléchettes with abrupt retouch have some analogy with the pointe de Châtelperron. Separation is, however, on two criteria: first, that the retouch on the pointe de Châtelperron is primarily on one of the two edges. On the other hand we note the fact that the base of the pointe de Châtelperron is convex or square. Apart from fléchettes, bayacien stone tools are relatively poor and commonplace; they are distinguished from the overlying Gravettian, first by the absence of large pieces, and also by the almost total lack of forms typical of the Gravettian. 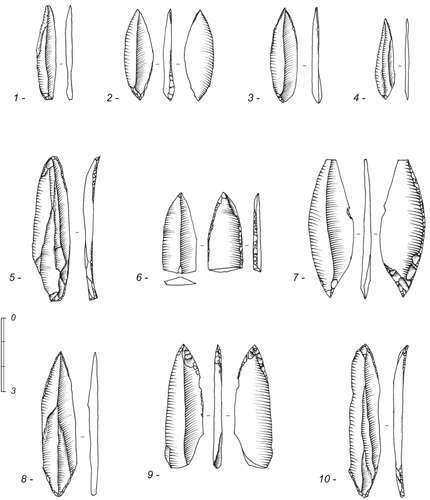 Scrapers (11.43%) are mostly represented by scrapers on the end of unretouched blades, of varying shape, often quite massive and there are some scrapers on flakes, different from the Gravettian. Burins (16.67%) are more numerous than the scrapers, with a net preponderance of dihedral burins (9.52%) and truncated burins (3.81%). Dihedral burins were varied, most lopsided. The series is complemented by a few pieces of Perigordian type, by two pointes de Châtelperron and some flakes of l'Abri Audi type, as well as some truncated blades and some scrapers. The presence of some pointes Châtelperron had led Lacorre to assume that this industry is an evolved form of the lower Perigordian, which has little evidence to commend it. 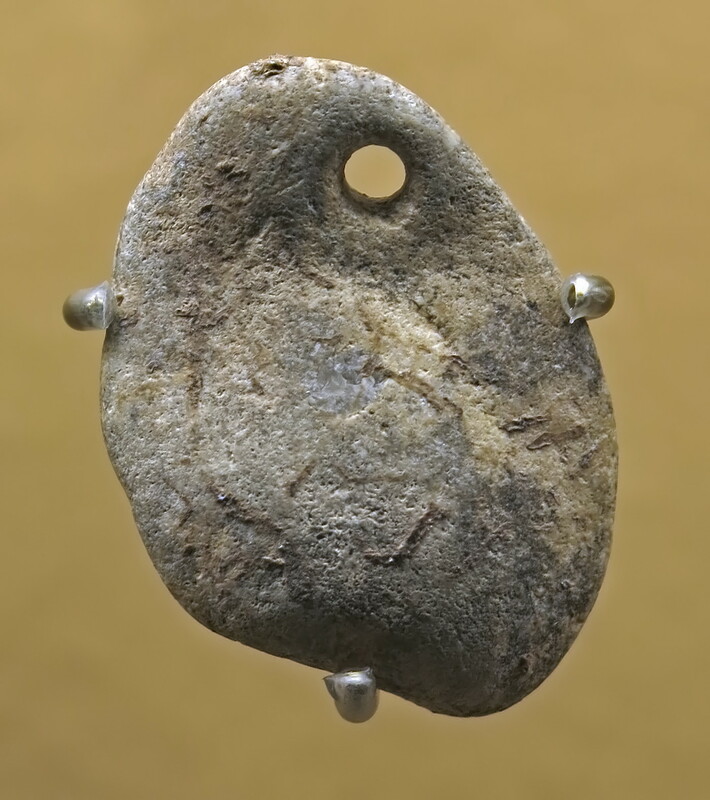 As for the bone tools, they are also commonplace, with some broken points and broken fragments of bone cutting and reindeer antlers, and a small oval ivory plaquette in ivory, very flat, is considered by Lacorre to be a broken pendant. In these circumstances, it seems not unreasonable to accept at least hypothetically, and with reservations, the proposed term of Bayacien. Delluc, B. and Delluc, G., 1982: La Gravette à Bayac (Dordogne). Rapport de fouilles de L. Tabanou (1888-1889) Bull. de la Soc. d’études et de rech. préhist. des Eyzies, 32, 9 p., 3 fig.